Home › What is Data Validation? 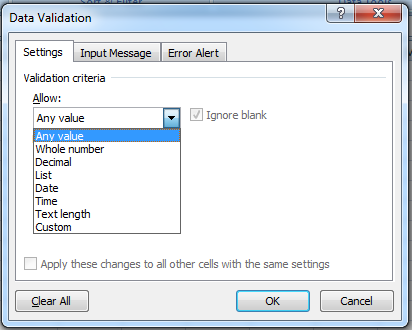 Data Validation is a very essential feature in Excel which is used where input data type or value has to be restricted. It prevents invalid data from being entered into a cell. Click to open the Data Validation window and here you will see three tabs. Allows you to choose from validation criteria where you have to choose the data type among Whole number, Decimal, List, Date, Time, Text length, Custom. In this tab you can enter a message to show when you select or click on the cell. Here you can set an error alert by stopping, showing warning or giving information when invalid data is put to the cell. Choose if you want your input data to be whole number only. Set the minimum and maximum value. Choose if you want your input data to be decimal only. Set the minimum and maximum value. Choose if you want your input data to be forced within a list only. It will show a dropdown list. Choose if you want your input data to be date only. Set the minimum and maximum value. Choose if you want your input data to be time only. Set the minimum and maximum value. Choose if you want your input data to be text only and the text length has to be restricted. Choose if you want customize your input data by using formula.